The US military’s space defence command, or NORAD, is currently tracking an orbiting object which analysts speculate might be designed to fix — or attack — other satellites. Governments keep tabs (and so can you) on what’s floating in low orbit, which is why NORAD initially labelled the object as space debris. But in May 2014, Russia’s government told the United Nations that a launch made last Christmas Day had sent four satellites into orbit, instead of the trio that is typically set up in a single launch. That could explain the provenance of the mystery object, which is moving towards other Russian assets in space before potentially revealing its function. “It could have a number of functions, some civilian and some military,” space security expert Patricia Lewis told the Financial Times. One of the possible military uses was the launch of “kinetic pellets which shoot out at another satellite,” according to Lewis. In wars of the future, it might be advantageous — though very publicly hostile — to take out a rival nation’s eyes. 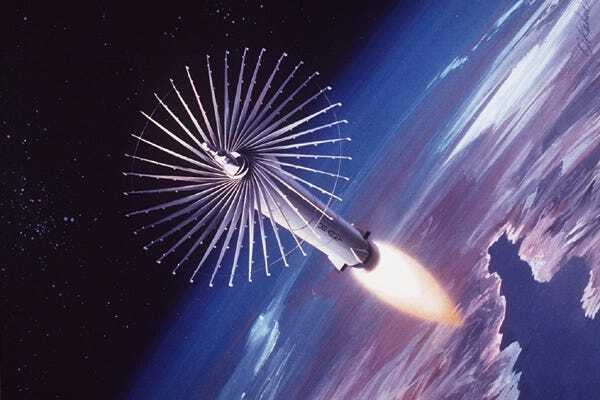 Killing satellites is something both the US and the Soviet Union tested in the ’80s, but had let go until China’s own testing led to the US doing the same (and making the said report). In 2007, China destroyed one of its own, ageing weather satellites with an anti-satellite device mounted on a ballistic missile. The result was a proliferation of space debris, which as depicted in last year’s blockbuster, Gravity, poses a danger to other satellites. The US followed suit the next year by destroying a spy satellite — one that was already out of commission — simply by ramming a missile into it; no explosive was used. At the time, the Pentagon specified that resulting debris would burn upon reentering the Earth’s atmosphere. The difference here, of course, is that Russia’s experiment could be a more permanent offensive asset rather than a missile used just once. If it is indeed a weapon, it could lend new urgency to the previously tentative race to weaponize not just air, land, and sea, but space as well.